Couldn't see if Stoff had an official one on the official official thread thread, bear with me, so thought I'd just start it as there's a great piece on him on Motorsport.com that I thought was very interesting so here it is. That is an interesting article. Also interesting to hear about Vettel's struggles with the car during his RBR years. Hopefully they're right and they can put together a package which brings out that raw talent we saw in GP2. Difference with the Vettel comparison is we've seen him deliver when the car suits him, we haven't actually seen that for Stoff yet. I really want to see Vandoorne do well, he seems like a nice guy and I simply can't believe that someone who dominated GP2 in a similar fashion to Leclerc is operating at his best whilst getting whipped this badly by Alonso. All this is well and good but considering that McLaren have been chasing after Ricciardo and now Kimi as well, Vandoorne's future at McLaren and in F1 itself is looking a bit bleak unless Red Bull take an interest in him given the dearth of viable Red Bull junior drivers. Good thing you made this thread, Lotus49. I've been thinking about doing it for the better part of a year, had some ideas for the opening post for the thread, but never really got around to doing it. So thank you. I hope we'll be able to post in this thread for years (at least in the context of him being in F1). Currently I'm somewhat pessimistic as things aren't really working out as most had expected, although with Alonso next to him he faces a very hard task. Unfortunately I think he's going to have to find a way to turn things around for himself this season or he will likely be out of F1. He wouldn't be the first promising prospect to have this happen to him. Paul di Resta, Kobayashi and many others have gone through this. Kobayashi, despite actually delivering some impressive results. I too expected more from him. I half expected him to be the best rookie since Hamilton but of course the car was crap and Stoff really hasn't had that magic moment in F1 yet. Not one top 5 finish or spectacular overtake. Nothing particularly noteworthy or memorable. Even just one performance like that would go a long way for his reputation. Not sure how likely those rumours are tbh and even less sure either of those drivers would be interested in going to McLaren at this point. I heard Stoff has some admirers in both Renault and Williams but the latter would need to stop wanting pay drivers for anything to come of it. Dan shocking me by going to Macca and Sainz taking his spot at RB could open the door for Renault whether Norris is promoted to Macca or not so I think Stoff will be ok. Alfa Romeo also via Vasseur could be an option if Leclerc moves on. The Paddock isn't going to forget his junior record and performances in every other series he's driven in just because he can't hang with Alonso in poor cars (which is historically when Alonso tends to put the distance between himself and his team mates) and with the team fully behind Alonso. That's a ridiculously tough gig for anyone never mind an inexperienced driver. No problem bud I could've sworn you made the thread so was scratching my head a bit when I couldn't find it lol. If you get round to making that opening post, stick it in a PM and I'll copy and paste it into the opening post if you want. To be fair a top 5 finish where his cars have been would be a total fluke through multiple cars retiring on the day he's near the front of midfield like Malaysia last year which was very good. Bahrain 2016 considering where the McLaren was is an excellent debut as well. Too many disappointing ones outside of those though it's true but I think his prior record is on another level to the likes of Paul and Kamui so he's got a fair amount of goodwill within the paddock I'd wager, but the lack of money he brings could be the thing that hurts him in the end as his form may well rule him out of the teams that don't need money leaving the ones that do need money but might like him as the only options left which would be too bad. I think I said I'd do it at one point but then never got around. This below is the first one I took from him with my own camera (had a little fun with the photo as well). 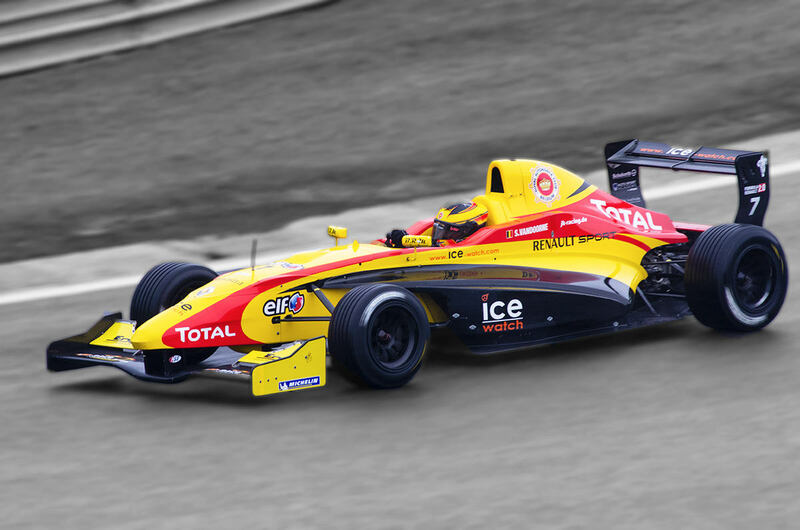 2012 - Formula Renault 2.0 Spa-Francorchamps round, Sunday race. He won the series, though couldn't win that day, placing third behind Daniil Kvyat and Jake Dennis. Other notable drivers that day were Gasly, Ocon, and a lot of drivers who went on to spice the junior series (Albon, Rowland, de Vries, ...). That's true but I think you need to be able to poach that big result if you want people to notice you. Leclerc has been in a car that is just as bad and in fact even worse but, despite the fact that it has only been 8 races so far for him, he has already managed to score a better result than Vandoorne has in his career. I don't get the sense that Vandoorne is particularly slow. His pace is probably just fine. He just doesn't seem to make anything happen for himself. I see no genius nor even just opportunism. I don't mean to be harsh. It's all relative. All of these guys have tremendous talent for what they do but Stoff seems to be lacking that special something extra that the top drivers have. If Leclerc gets promoted to Ferrari then I believe his Sauber seat is ear marked for Ferrari junior driver Giovinazzi, whilst like you noted even though Renault have shown interest in Vandoorne that seat only becomes available if Ricciardo leaves Red Bull which I would bet against happening. If McLaren let Vandoorne go then I only really see STR as an option for him. His most impressive race was probably his debut. I've been disappointed by Vandoorne so far, I had really high hopes for him. Sadly I guess his only real point of comparison has been Alonso. Maybe a fresh start at another team may get his career going, he's still shown enough promise for someone else to pick him up. His most impressive race (by far) was Malayisa last year, where he comprehensively out-qualified and out-raced Alonso. Sadly, he's never really showed signs of doing it again. There does seem to be a difference between drivers who excel in junior series and those who excel in F1. It's constantly said that in F1, the driver is doing so much more than turning the wheels, changing gears, accelerating and braking. There's constant management of the tyres (on another level to junior categories), engine settings, etc. etc. etc. I wonder if it's these stark differences in the role of the driver which result in rookies underperforming in F1? There's been quite a few examples recently. No longer can you just have raw driving pace, you must also have significant available mental capacity to manage the car.